This year again, our White Peaks winter campaign took us to the Alps. While we decided to explore the Bavarian side of this mountain range last year, we opted for its French part this time and headed to ski resort Montgenèvre. Simply put, we just can't resist this gorgeous region, its breathtaking landscapes, world-class ski slopes and... numerous architectural wonders. Let us guide you through 7 of our favorite buildings! Inspired by local rock formations, the Pass Museum was designed by South-Tyrolean Italian architect Werner Tscholl and is one of five small architectural sculptures located along a 12-kilometer-long alpine road that links Italy and Austria. Home to a permanent exhibition that focuses on the history of the area, the museum was meant to evoke an ice cave. Its exterior aims to blend in with the museum's surroundings and its concrete has a brownish color similar to that of the rocks that can be found around it. The building's appeal also comes from the fact that it seems to touch the ground on a single point and to be precariously balancing in the air. This impressive shelter meant for climbers of Slovenia's Skuta mountain was designed to stand up to the area's extreme weather conditions all while referencing its vernacular architecture. For this project that was developed to replace a 50-year-old bivouac, OFIS Architects collaborated with students from Harvard's Graduate School of Design. The building is made of three separate modules which were transported to the site and installed over the course of one single day. Offering stunning views of the surrounding landscapes, this shelter features a first area made for storage and food preparation, another one dedicated to sleeping and socializing and a third room with bunk-beds. Perched on top of Europe's highest peak, this iconic mountain shelter is located on the Mont Blanc and is officially France's highest building. It was designed by architect studios Group H and Decalaage. Built with local wood and stainless steel, the refuge's components had to be made in the valley below before they were brought to the site using a helicopter. To be able to withstand the extreme weather conditions associated with such high altitude, the structure is anchored into hard rock at an average depth of 12m. Its futuristic-looking shape earned it the nickname "the UFO" and allows it to be completely self-sufficient by making use of available natural resources, for example by generating electricity with photovoltaic solar panels. Not only does it offer 360-degree views of surrounding Italy and Slovenia, this cabin is a sight in itself! Designed by Slovenia-based architecture firm Ofis Arhitekti, it is made of wood and aluminum and was built solely thanks to donated money and materials. Perched atop a cliffside, this small, minimalistic structure comprises three areas and can provide accommodation to up to 9 mountaineers. Its interior design is extremely stripped-down, and the only decorative item is a hunting trophy of a pair of deer antlers. As for other mountain refuges, the idea here was to build a structure that would be able to stand up to any weather conditions. Perhaps easier to access (and larger) than other mountain shelters we've featured here, this hut is an ultra-modern building that manages to be almost entirely self-efficient in terms of energy. Providing 120 beds to mountaineers in summer and ski touring fans in spring, it offers mind-blowing views of several glaciers and some of the highest peaks in the Alps, including the neighboring Matterhorn. Often compared to a rock crystal, this five-story hut has an aluminum outer covering and is built on stainless steel foundations thrusting down into the rock. It is also considered to be the most complex wooden-structure ever built in Switzerland and is the result of a research project conducted by both the Swiss Alpine Club (SAC) and Zurich’s Federal Institute of Technology (ETH). Designed to combine ecology and luxury, this resort is located in a private ski area in the Cernier-area of the Swiss Alps. It comprises 15 pods that are each fully equipped to ensure guests a comfortable stay, whether they are enjoying a family vacation or a romantic getaway. Each set on their own wooden terrace, these pods and their large bay windows offer a stunning backdrop of the surrounding landscape. This hotel concept was awarded with the World Prize for Sustainable Tourism in 2005 as it strives to be as energy efficient as possible and to have a low impact on nature. It uses local spring water, local wood and a wood pellet heating system. This structure was built where the former Olympic ski jump used to be and aims to be a contemporary version of a landmark. It was designed by Zaha Hadid Architects following an international design competition organized by the Austrian Ski Federation and was opened within just one year of the former ski jump being demolished. Architect Hadid described her design as an “organic hybrid” between a tower and a bridge. 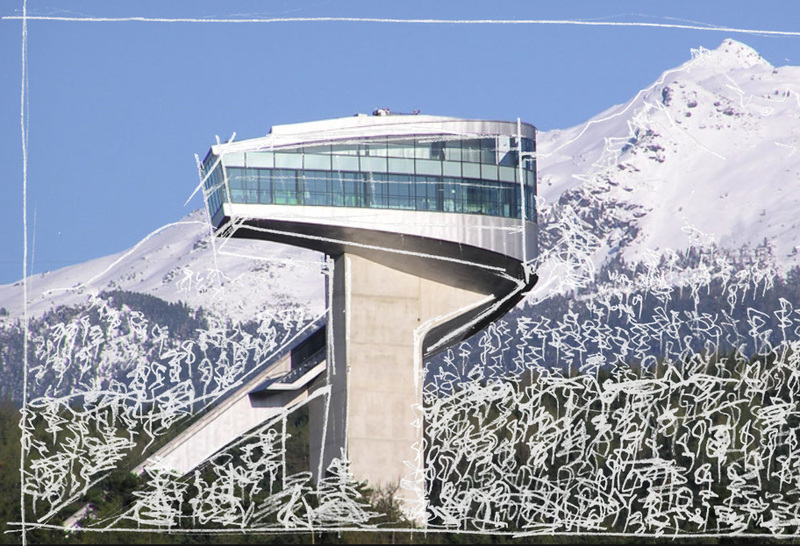 Unless its predecessor, this facility includes public spaces comprising a viewing terrace and a café, which makes the ski jump a prime viewing point overlooking both the Alps and the city of Innsbruck.